Level 1A - Basic yoga postures and concepts (including alignment, breathing, and relaxation). Recommended for new students. Level 1B - Appropriate for continuing beginners or capable/athletic new students. Class includes introduction to shoulderstand and variations. Level 2 - Refinement of basic postures and concepts. 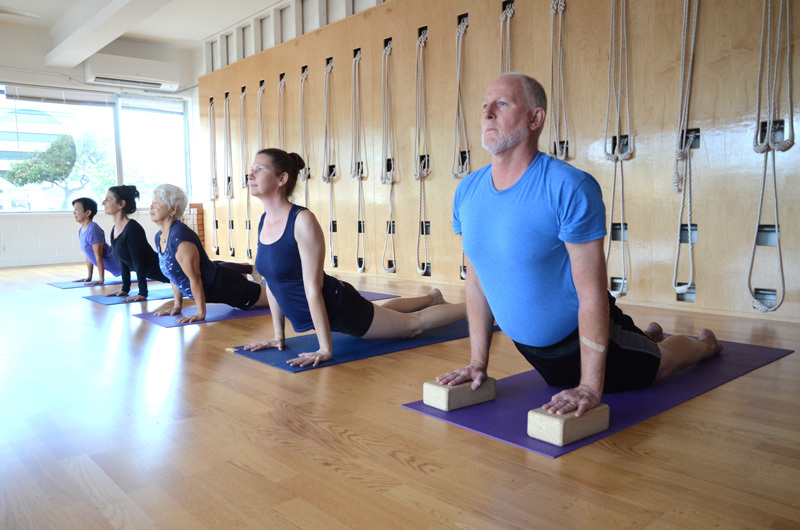 Wider range of poses, including inversions, backbends, and forward bends. Level 3 - More intensive work and detailed instruction for experienced Iyengar yoga students who practice regularly. Students should have facility with standing poses, headstand and shoulderstand, and be prepared to work on more difficult poses. Pranayama - The art of yogic breathing. 6 months Iyengar yoga experience recommended. Please review our Kaimuki or Mo‘ili‘ili Schedules. To register for a class, click on the “My Account” link in the top right corner of the Schedules page. You will be taken to our Mind Body page, where you can create your password protected account, register, and pay. Please arrive a few minutes before class to sign-in. Wear shorts or footless tights. Please do not eat right before class. Advise your teacher if you have significant health problems, concerns, or are pregnant. In consideration of others, please do not wear heavy perfumes.